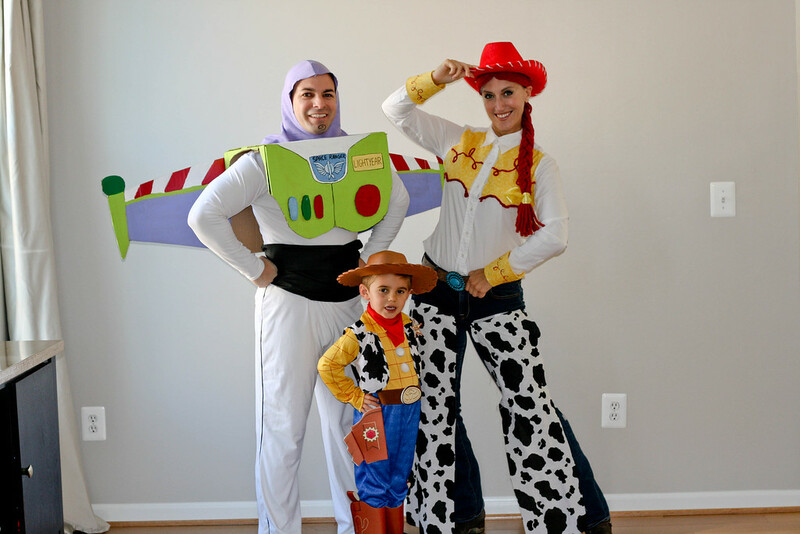 DIY Family Toy Story Costumes Mama Say What?! | Mama Say What?! We love dressing up for Halloween as a family. We let my son choose his costume then my husband and I base ours on the theme of his. This year he wanted to be Woody from Toy Story. His costume was on sale for cheaper than I could buy the parts to make it so that made it very simple. For my husband’s and my costume, I didn’t want to spend much money but still wanted to create the look of the Toy Story gang. I was able to create both of our costumes for less $20 total and kept it simple with no sewing. For my costume, I chose to be Jessie the cowgirl. I found a used white, button down dress shirt for $5 then bought a half yard of yellow fabric and a bundle of red yarn. 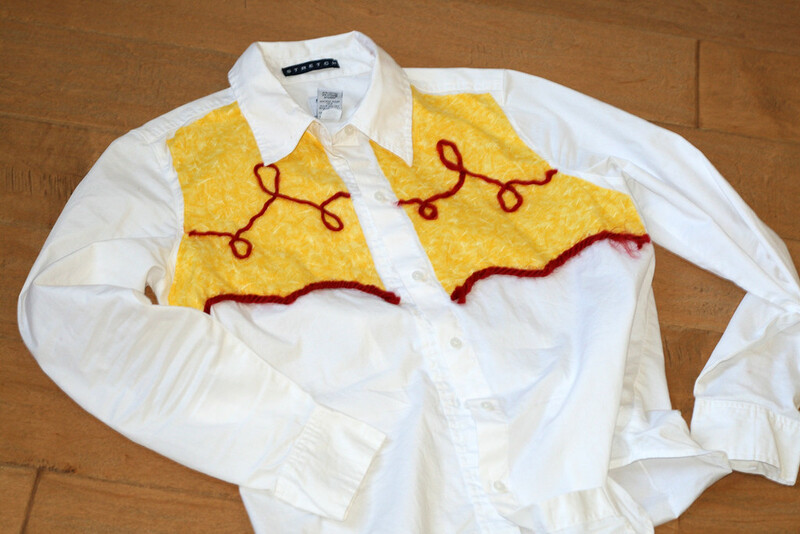 I laid the shirt down and cut out the shape of the yellow part of her shirt and glued it down with some fabric glue. Then I used pieces of red yarn and glued them down for the red lines. For her cuffs, I used plastic cups with the bottoms cut off, wrapped some of the yellow fabric around them and glued it down. They slip right onto my wrists over the shirt and look like Jessie’s cuffs. For the lines I used red craft paint and a small brush to draw on the swirls. I purchased the red hat at Party City for $5 then wrapped some white yarn around the edges to make it look like Jessie’s hat. Since I’ll be wearing the hat, I only needed to create her yarn hair to show around the edges and not to cover my entire head. So I used a wide fabric headband, the kind I use when washing my face. I stretched it around one of my son’s bouncy balls to hold it in place while I glued the yarn around it. I simply drew a line of glue and laid the yarn down on it row by row, leaving very long tails at the end. Then I braided the tails and tied it with a yellow ribbon. When worn with the hat, it looks like I have a head full of yarn hair. I paired the shirt with a regular pair of my own jeans and brown belt. I got a half yard of cow print fabric for a few bucks, cut out the shape of chaps and used safety pins to tack it to the pants legs so I can easily remove it after Halloween. I threw on a pair of brown boots and the look was complete. My husband’s costume is Woody’s best friend, Buzz Lightyear. To create the chest piece I used a cardboard box I had from a recent amazon shipment. A large diaper box works great for this as well. I cut a circle out of the top for his head and upside down U shapes on the sides for his arms. Then I painted the whole thing with craft paints and used a sharpie marker for the final accents like his name tag. 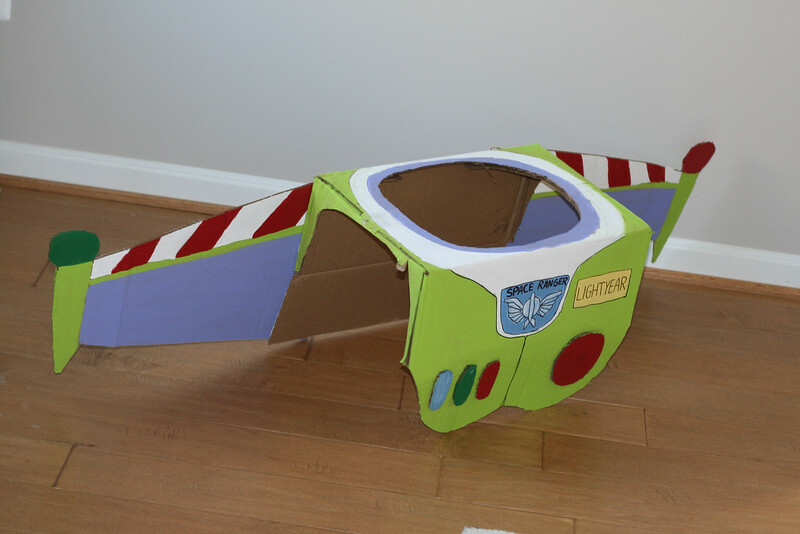 Another cardboard box was used to cut out the wings. They were painted then hot glued onto the back of the first cardboard box. I got 1/4 yard of purple fabric, cut out the two sides for the basic hood shape and used the fabric glue to create the seam down the center of the head. When it dried, I turned it right side out. He already had a white shirt and the white pants were leftover from a previous Halloween costume. A half yard of black fabric is wrapped around his waist then pinned in the back. The cardboard box slips right over his head and rests on his shoulders, completing the look. I really could have gone crazy adding more details and costume parts. This was such a fun family theme! But I wanted to keep it all simple and stress free. I hope you are able to use these ideas and techniques to create a Toy Story fantasy for your little ones! Added by Laura K. on October 23, 2014. Really cute! 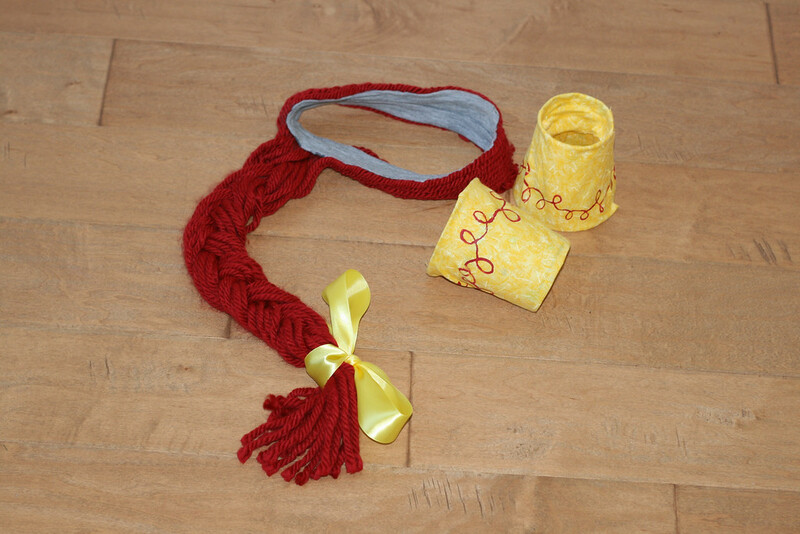 May I ask how you wrapped the yarn around the Jessie hat? I used a large needle and poked it right through the hat to thread the yard through and around the edge. What kind of glue did you use for wig?